This property is part of the New Golden Mile Villas. 10 superb high-end villas with open plan living spaces and gardens with infinity pools for sale in New Golden Mile. 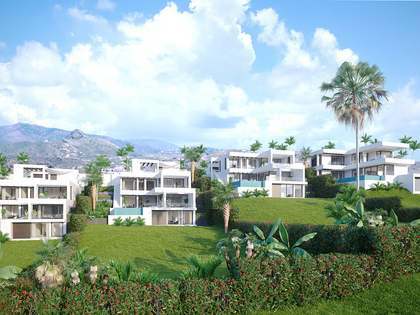 Prestigious new development offering this luxury 4-bedroom villa for sale with golf club membership in New Golden Mile. This new development at the heart of New Golden Mile is surrounded by golf courses, kilometres of sandy beaches with beach clubs, restaurants and yachting clubs. This stunning luxury villa with incredible golf and sea views enjoys the privilege of a 1-year membership to prestigious Golf Club that offers exclusive services and facilities for residents including a restaurant, bar, spa and gym, indoor heated pool, padel tennis court and outdoor pool in landscaped gardens; all within walking distance. 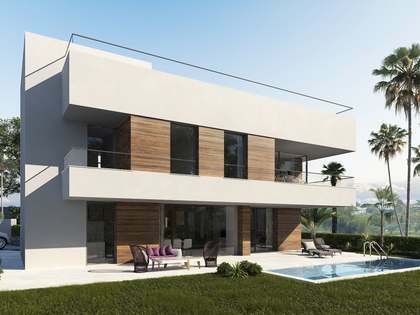 The villa within this innovative boutique development combines the clean lines and functionality of Scandinavian design with the warmth of Mediterranean colours. It feature an open plan ground floor with free-flowing living, dining and kitchen spaces, all leading out to large terraces and a glorious infinity pool. The upper level offers 3 well appointed bedrooms, each with underfloor heating, its own en-suite bathroom and a dressing area in the case of themaster suite. The solarium on the top of the villa provides 360º panoramic sea and golf views and can be customised by each owner to adapt to their lifestyle, with an outdoor dining and barbecue, chill out area or a jacuzzi. The villa's basement are also available to personalise with over 150 m² of space with natural light and direct access to the gardens , offering great potential for further bedrooms, a family living or games area, home cinema, sauna or gym for example. Excellent lifestyle homes on the coast. This project is under construction and expected to be finished by the second quarter of 2019.